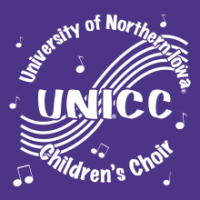 The University of Northern Iowa Children’s Choir (U.N.I.C.C.) is a vocal performance ensemble for students in grades 3 through 9. The ensemble provides an opportunity for children to make music together, further vocal development and present high quality concerts. The members rehearse once a week (Tuesdays) at the Gallagher-Bluedorn Performing Arts Center, in Jebe Hall. The choir also provides a learning experience for UNI music education students to rehearse a children’s choir, enhance conducting skills, deliver or articulate instructions and announcements, and organize a performing ensemble. As both a pedagogical tool and a performing ensemble, the choir presents two concerts per year as well as other arranged performances throughout Iowa. The choir has performed with the Waterloo/Cedar Falls Symphony Orchestra on their Holiday Pops Concert, the UNI Chamber Orchestra, the UNI Men’s Glee Club, and at many other special occasions. The choir is under the direction of Michelle Swanson, Instructor of Music Education at the University of Northern Iowa School of Music. Dr. Swanson teaches Elementary General Music Methods and Music Appreciation, and also advises music education students and supervises student teachers in elementary general music. Dr. Swanson taught elementary general music for 20 years. 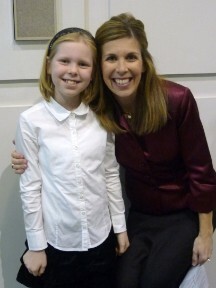 She has guest conducted numerous elementary, middle school, and high school honor choirs throughout the Midwest and won several teaching awards. She is married to Chad, who is an attorney in Waterloo. Michelle and Chad have two children: Elizabeth (19) who attends the Univ. of Iowa, and Matthew (14 1/2) who were both members of UNICC. The musical Swanson family enjoys to perform in weddings or other functions often. For audition, rehearsal, or performance questions contact UNICC director Michelle Swanson at 273-2600 or Michelle.Swanson@uni.edu. The choir provides an opportunity for UNI college students to work with real children in a choral setting. The students, primarily music education majors, work with the students in large group rehearsals, solo auditions, pitch matching activities, and concert productions. The students organize and attend to many details at each weekly rehearsal. This is a voluntary opportunity for the UNI students. Thank you for your interest in supporting the UNI Children’s Choir! The Children’s Choir is a vital part of the Community Music School at the University of Northern Iowa. The UNI Children’s Choir is a select group of 3rd through 8th grade singers from throughout the Cedar Valley. Our mission is to provide quality choral music experiences for our members in weekly rehearsals and two concerts on campus each year. We also travel periodically to festivals and perform as requested at outreach events. In addition to being a youth ensemble, the UNI Children’s Choir is also an integral tool for music education students at UNI. The pre-service music educators work with the UNI Children’s Choir to learn and enhance their skills in choral music education. The students accompany, conduct, and assist at rehearsals and concerts. Our regular programming budget includes accompanist fees, music purchases, festival registrations, program printing, transportation (charter bus) to events, and scholarships for participants. We are raising funds to support all of these musical and financial endeavors. If you would consider financially supporting the UNI Children's Choir, several options are possible. All donors are listed in the UNICC programs and on our website. Donations are tax-deductible. Donations can be made at the UNI Foundation page.